We've seen a lot of these rigs since Intel and YOYOtech went all Norris McWhirter on us with their combined Fi7epower MLK 1610 efforts for the launch of the Core i7. That was the fastest machine available in 2008 and a year and a half later we've the Hydro Nemesis from Cryo PC that makes it look like Babbage's difference engine. In between, YOYOtech has tried its hand again with the Fi7epower refresh: the MLK3, and that's a rig that's gotten pretty damned close to the speed of this machine. The Hydro Nemesis has got something beating in its silicon heart that makes it a much speedier beast: Intel's brand new Core i7 980X Extreme processor. Yup, the £800, six-core processor has found a home in Cryo PC's liquid-cooled gaming behemoth. Along with the twin HD 5870 graphics cards that makes this the fastest gaming PC available today. The Core i7 980X holds six cores, and in Intel's HyperThreaded world that makes for a mammoth twelve threads of processing performance in this powerhouse of a chip. The is the second of its chips to be based on the new, teeny tiny 32nm production process. It's definitely a case of more in less space. The chip itself is smaller than a Lynnfield core, 240mm2 compared to 296mm2, but manages to cram in those extra two cores at the same clockspeed as the Core i7 975, and with the same 130W TDP. You also get a rather astonishing 12MB of shared cache memory. It's one tidy little package then. When you're talking about multi-threaded computational work you're not going to find a faster commercial CPU on the planet - at least you won't outside of Intel's own testing labs. Cryo PC, doesn't think that's quite good enough and has gone to great lengths to install a full watercooling loop to take care of this monster CPU and give it a fairly hefty factory overclock. It's also crossed the 4GHz threshold, clocking the i7 980X at a lightening 4.2GHz, almost managing to up the clockspeeds by a full 1GHz. This is mainly thanks to the Asus Republic of Gamers motherboard forming the basis of the Hydro Nemesis. It's the Rampage II Extreme X58 super board in this spin, but later revisions will use the brand new Rampage III Extreme. As you'll see from our review, that's a board that will happily top the 1GHz overclock on air-cooling alone. That may up the cost of the Hydro Nemesis by another £100 or so, but the addition of SATA 6Gbps and USB 3.0 might just make that an edition worth having. Unfortunately, despite being included in the watercooling loop, the graphics cards themselves haven't actually had any tweaking done to them at all. It's possible though that having the extra heat generated by the dual-GPU setup leaching into the coolant may just upset the CPU itself. That said though the dual HD 5870s do an incredible job of churning through any benchmark you care to throw at them. This was ably demonstrated by YOYOtech's latest Fi7epower rig, but with the Gulftown CPU backing them up this pair of cards is, in fact, slightly faster in this configuration. It's also worth noting how CrossFire has come on in recent times. Following AMD's decision to have its top-end graphics card specifically a multi-GPU device, it had to rework its CrossFire drivers to bring some more real-world benefit to having that extra GPU crunching away. Previously, you were looking at between an extra 40 to 60 per cent boost when a second card was added, with a law of diminishing returns governing each extra card you added in CrossFireX configurations. The situation is very different now. We tested the Hydro Nemesis with CrossFire disabled to see how much difference we got out of the second GPU and the results that came back almost doubled the performance. Taking the DX10-based Far Cry 2 as an example, at 2,560 x 1,600 it was showing an average 47fps on a single HD 5870, with both enabled in CrossFire that leapt up dramatically to 86fps. That's a boost of 83 per cent. On DiRT2 that went up again to 93 per cent with scores of 45fps rising to 87fps with two cards. This has long been the goal for both SLI and CrossFire; AMD's configuration has now definitely proved its worth, next month we'll find out how Nvdia's latest Fermi cards stack up in its own multi-GPU setups. So how does the Hydro Nemesis stand up against the other lightning-fast rigs we've featured in the hallowed pages of PC Format over the last few months then? Well, we can forget the original Fi7epower MLK 1610 (with X264 video encoding scores of 81fps vs the Hydro Nemesis' 123fps), but the MLK3 revision is probably the closest you'll get to the Cryo PC uber-rig. That machine requires you to empty your wallet to the tune of £5,500, probably reinforcing the floors of your house and installing a desk fashioned entirely from solid titanium in order to withstand the weight of the damned thing. Like the Hydro Nemesis it comes with twin HD 5870s, but the older Core i7 975 CPU is what lets it down in the processing department. The MLK 3 is clocked at 4.14GHz against the Hydro Nemesis' 4.2GHz, but it's the extra two cores that really make the difference when you look at the multi-threaded performance in Cinebench. The overclocked Core i7 975 comes in at a thoroughly respectable 39 seconds; the Core i7 980X though beats that by fully 13 seconds with a time of 26 seconds. We've only seen that time bested using the updated Rampage III Extreme board that's soon to furnish the Hydro Nemesis itself, and only then by a solitary second. In gaming terms things are a lot tighter. Far Cry 2 only shows an extra 2fps over the MLK3, and the DiRT2 scores aren't going to be much different now that AMD has amended the multi-GPU problems it experienced with the initial HD 5870 drivers and Codemaster's awesome racer. But it's faster across the board against a machine that isn't far off twice the price of the Cryo PC we've got adorning our test bench at the moment. All you're missing out on is in storage terms and the amount of RAM available to you. As we've seen from the MLK3 with 12GB DDR3 and CyberPower's £2,800 Infinity i7 Pheonix with a huge 24GB DDR3; when you start adding in RAM over 6GB in Windows you're going to see very little tangible benefit for your outlay. The storage issue though is something quite different, and is the only really serious oversight in the composition of Cryo's latest machine. There is no SSD boot drive. Now I understand that as a magazine we've been fairly reticent to recommend rushing out and making the switch for your existing rig, but the Intel SSDs, in particular, have our vote. The MLK3, in comparison, comes with twin 80GB X25 making for an incredible RAID array in performance terms. Those drives are expensive and would push the price of this already pretty pricey ol' rig past what any reasonable human being would be willing to pay. We've seen though with Overclockers UK's Titan Viper that you can have performance SSD boot drives for a more economical outlay. That rig only comes with a single 40GB drive, but that's Intel's budget SSD and it's got all the speed you need if not the capacity. Paired with the 1TB drive that's already occupying the Hydro Nemesis that would be an easy upgrade that would make a real difference to your every day PC usage. I'm not entirely sure about the aesthetics of the Noctua cooling fans either. For some un-godly reason Noctua has decided flesh pink is the ideal colour for performance cooling. It wouldn't be so bad if the rear fan didn't stick out so far from the chassis like some whirring tumour. In all-round performance terms then this Cryo PC has got it where it counts. Now we get into the altogether more sticky realm of value for money. At over £3K this is not a rig that's going to suit everybody, but it's not as entirely unreasonable price as something like the Fi7epower MLK3's £5,500. It's also much faster than YOYOtech's rig, pretty much rendering that machine obsolete. 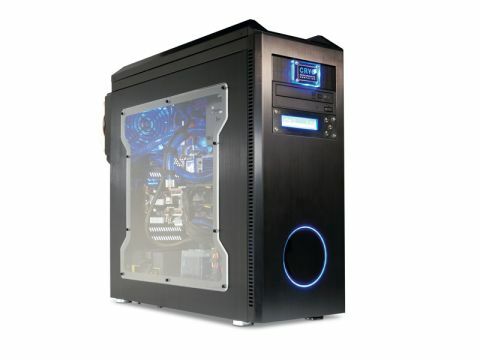 Then we've got the Titan Viper, a beast of a PC at only £1,600. The cheaper mix of Core i7 930 clocked at 4GHz and the HD 5970 means it's almost exactly half the price of Cryo's rig, but with impressive performance to go along with that. In Far Cry 2 and DiRT2 respectively it's 14fps and 20fps slower than the Hydro Nemesis. When you're talking about frame rates that are well over 60fps though the difference becomes more intangible. We're sure that with a little tweaking here and there you could even push this rig further. Some judicious GPU overclocking in the safety of that watercooling loop and frame rates could go through the roof.